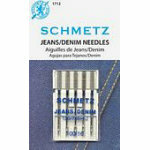 Also called Jeans Needle. The modified medium ball point and reinforced blade make this needle perfect for penetrating extra thick woven fabrics like Denim or mulitiple layers in Quilts. The reinforced blade causes less deflection of the needle and reduces the risk of needle breakage and skipped stitches. System: 130705 HJ. Size: 1490. 5Pack. Carded.